It is Cec here and I am sharing an Inspiration post with you. 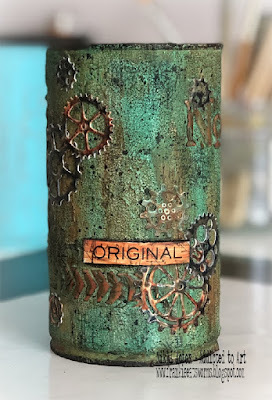 Since there is still a couple of weeks left before our current challenge called Industrial/Grungy ends, I thought I would show you how to make a simple mixed media canvas with an industrial vibe. 1. Coat a 6" x 8" canvas board with White Gesso (Liquitex). 2. 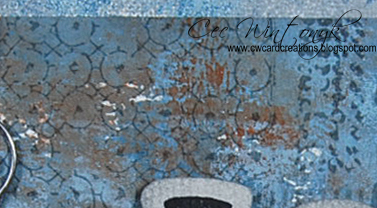 Use a brayer to add layers of paint - Space Cadet. Lake Wanaka and Cinnamon Fresco Finish (Paper Artsy) leaving some bits of white showing. 3. Repeat this on a piece of heavy card stock using more of the Lake Wanaka paint, which is the darker of the two blues. 4. 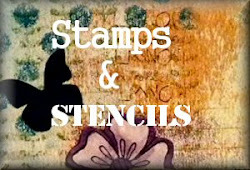 Using Watering Can Archival Ink (Wendy Vecchi) add stamping with stamps from Faded Fragments (Seth Apter) and Shine Bright (IndigoBlu). 5. 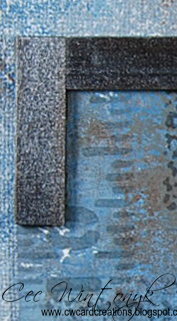 Paint small wood strips with Gunmetal Gray Metallic Acrylic Paint (Folk Art). 6. 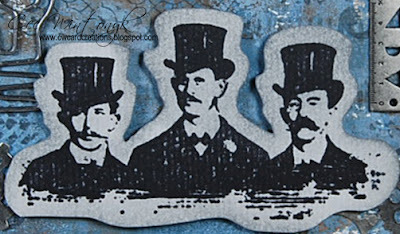 Using Jet Black Archival Ink (Ranger) stamp three gentlemen from Curious Possibilities set (Tim Holtz) onto heavy card stock and fussy cut. These fellows remind me of rich Captains of Industry from the late 1800s and early 1900s such as J.P. Morgan, Andrew Carnegie, Andrew W. Mellon, Henry Ford and John D. Rockefeller. The term often overlapped the term Robber Barons - hmmm! 7. Ink image with Hickory Smoke Distress Ink (Tim Holtz). 1. Using Soft Gel Medium (Golden) glue wood strips to card stock panel to create corners. 2, Add card stock panel to canvas board with dimensional foam. 3. Add image to panel with dimensional foam. 4. Using Soft Gel Medium add a variety of metal embellishments - Gears and Ruler (Bead Landing), Brads (Making Memories), Light Bulb Clip that I cut apart (The Paper Source). There you have it, another Industrial/Grungy project. Remember that lots of layers of paint makes for a grungy look and the metals can be anything you have on hand even if they don't match one another - just take alcohol ink, embossing powder or paint to them to unify the colour if that is what you want. Hello and welcome back ! 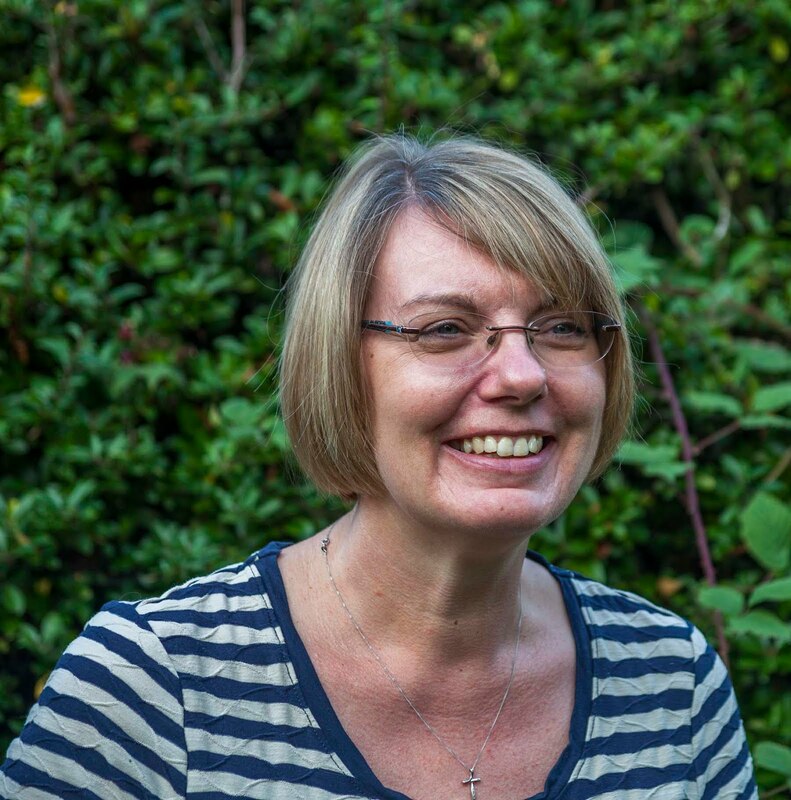 Today we are welcoming another well known face as our Guest Designer, Nikki Acton ! 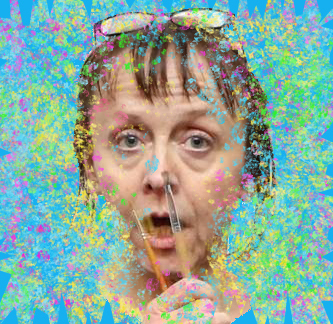 I am Nikki, from Addicted to Art. 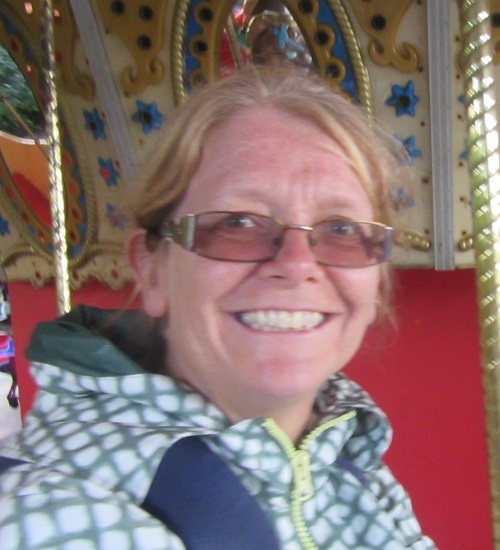 I live in Hampshire in the UK, although originally from the Midlands. 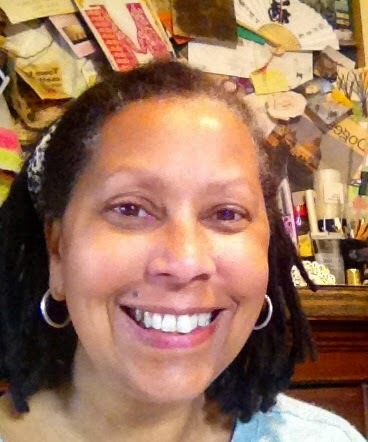 I have been crafting since late 2013 when a friend introduced me to the world of mixed media, cardmaking and scrapbooking. My style is eclectic but generally a little grungy - although I can be found occasionally being a little cleaner and brighter! Hi everyone, it is a pleasure to be a guest here today and share a project for the current challenge: Industrial / Grungy. I decided to alter a coffee tin. I began with a coat of matt medium and then added Deco Art Crackle paint and Texture sand paste – quite randomly in varying thicknesses. 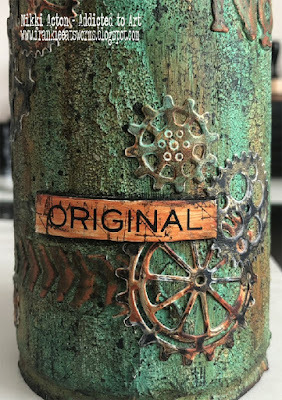 Once dry I added some stamping and a little stencilling with texture paste – selecting stencils that were relatively forgiving as stencilling on a curved surface is challenging! I used Deco Art Media Fluid Acrylics to build up my colours. (Blue Green Light, Transparent Yellow Iron oxide, Quinacridone Gold and Paynes Grey). I stopped after some colour and dried before lightly sanding the stencilled areas to reveal the white texture paste. This allowed the additional colours to be bolder over these areas. Once it was dry I added a little more stamping in archival black ink. I cut some cogs (Tim Holtz Gearheads die) of different sizes and divided them into 3 piles as I wanted them all to have different colours. 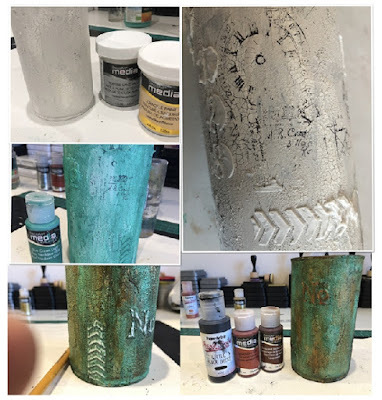 I brayed each set with a metallic paint either silver, gold or copper – brayering allowing some of the white card to still show. I then added coloured paint as shown in the photograph below. Finally to arrange and adhere my cogs. I decide on the front and focussed on this area, also adding a few around the circumference of the tin too. I added a Tim Holtz quote chip which I coloured with Quincridone Gold paint and added some stamping for scratch effects. Thanks so much for stopping by – I hope you like my grungy tin! 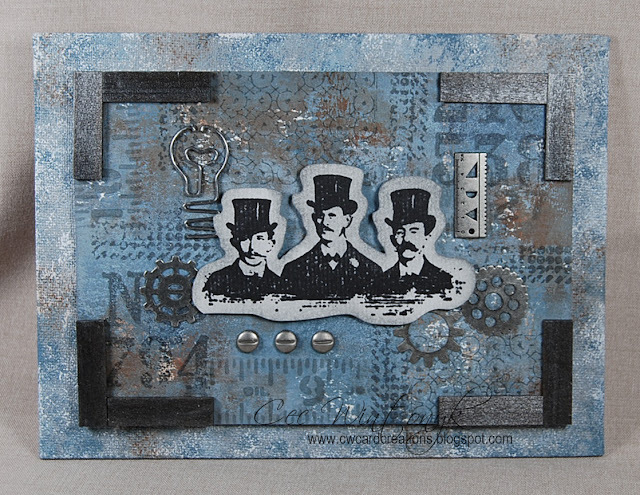 Thank you so much Nikki for sharing this fabulous project and inspiration for the current challenge Industrial/Grungy.